After my visit in the hospital I have decided to have lunch in a new shop at the corner. It seems to be a chain and a lot of people are queuing up, so I am interested in the taste. Finally I got a seat and I ordered the food (in Chinese). After a while two men came in and sat beside me. Both of them ordered the same dish as me: Kimchi Dumpling with Soup. One of the guy looked very familiar, but I just can’t remember from where. I was concentrating 「(ーヘー;) え～とto find out why he looked so familiar rather than how the food taste! It seems he is a local HKG guy, around 30 years old and might work in the bank. hmmm.. he recognized that I was starring at him, I just smiled and thought. Where did I met him? （←_→）？？Maybe, during a gathering, dinner, KTV, dragon boat, friends’ friend? He actually remembers me to my home… “Ah~~~~~ my bedroom!” I remembered (ToT)σ suddenly. The guy looked at me with a What-happened-face. I definitely cannot tell him! I finished my food very fast, paid and left (escaped?) ε=ε=ε=ε=ε=┏( ・_・)┛ダダダ！！ the restaurant. Can you keep secret? Well, I will tell you! Actually I do not know this guy in person. He looks so familiar because of his shirt. His shirt has the same pattern as my bed cover, sheet and my pillow case! Good taste that familiar guy! 3 years ago I came to Hong Kong!! Time is flying so fast. So many things have been changed. Including me. The first days/weeks in HKG (and also in between) were not easy at all, but all those experiences make who I am now. I like myself much more than before! Meanwhile I have discovered sooooo many islands, country parks by Hiking, desserts, restaurants, good shopping malls, traditional Chinese festivals, new sports e.g. dragon boat, typhoons, cockroaches, adventures … too many to count. I welcome so many friends, got to know new people and also did a lot of farewell of my friends. HKG is a country, where people come and go. Since I am in HKG, I have started to discover Asia. E.g. Japan, Taiwan, China, Vietnam, Thailand, Macau. It is indeed very convenient and also for reasonable price. I always bargain. Hehe. HKG is varied, offers a lot of programmes. When I came to HKG at the first time, I felt very excited. Now living 3 years here, I also have to recognize the programme is every year the same. What do you think about HKG? Compared to Asian Ladies my shoe size is pretty huge (European size: 41), so that’s why it is not easy to find suitable elegant shoes for me in Hong Kong. If I ask for sneakers in this size, the staff will believe that I am buying some shoes for my boyfriend! Fitting the shoe, the staff will definitely say “Miss, this is for man.” I often answer “It does not matter; my boyfriend has the same shoe size than me.” “Oh, that’s very convenient.” Before I used to answer “Thanks for info, I know. This is for me!”, then I got the reply “Oh, you have such big feet, sorry!” Are they really feeling sorry?! After work, I have decided to go to the Nathan Road to buy some shoes. I fell in love immediately in a blue navy shoes and I imagined I am running at the beach during sun set. “Excuse me, do you have this shoe in size 41?” “ For you? !” I nod. “Oh, you have such big feet! … Wait I will check.” After a while the young man came back “We only have 39.” I was disappointed “Ok, thanks for checking.” Then he says “You may try! It will fit to you!” No, definitely not, it is too small! No time to think for long time. The young man pushed me down to the chair, kneed in front me, unwrapped the shoe, took my foott and helped me to wear the shoe. “Oh, your feet do not fit. 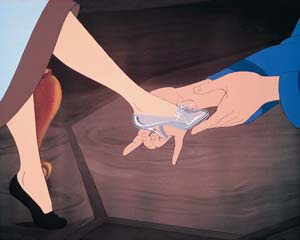 Your feet are too big.” I suddenly felt like Cinderella! Sorry, guys, I am not your princess… or better to say you are not my prince. And by the way, I think the shoe is too small. Or should I cut my feet in order to fit like the step-sisters of Cinderella, in order to fit into the shoe to be THE princess?! On the 1st of July around 1pm I lost my black coloured bikini pants in the Saikung sports Center, female shower room. If you found it, please let me know!